Finally, a blank-firing pistol manufactured to the same high quality as a regular cartridge revolver. The aluminum alloy frame along with a rust resistant blued finish and high strength heat-treated steel parts deliver trouble free usage. The automated drop safety lock and machine tooled steel double-action-trigger mechanism create a safe, dependable tool for your dog training and track/field event needs. 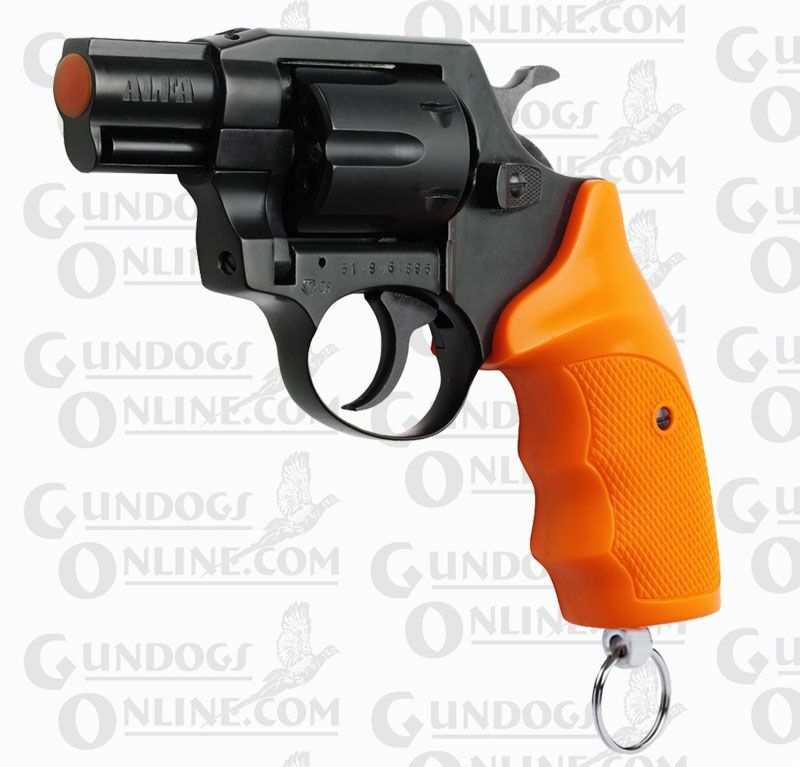 The Alfa Starter Pistol is rugged and reliable with bright orange grips made of high impact polymer and has an orange cap on the barrel as a reminder that the revolver is not a firearm and is only capable of chambering standard blank ammunition. The six shot swing out cylinder allows easy loading and unloading. A lanyard ring is included for convenience and security. Comes complete with a carrying case and cylinder cleaning brush. Now available to use a dependable, big bang .209 shotgun primer. .209 primers are very inexpensive and can be found at most sporting goods stores and provide a good sound for your dog training requirements. Please note: our large frame Cordura holster and the Gundogs Online leather holster (neither are included) will fit this blank pistol. The Alfa Starting Pistol is also available in a .22 Caliber version - Click here for details. All models of the ALFA starter pistol have a LIMITED LIFETIME WARRANTY for the original customer. PLEASE NOTE: Possession of Blank Starter Pistols (Starter Pistols) may be prohibited or restricted in some locales. As the buyer, you are responsible to determine the legality of owning a blank pistol in your particular area. Purchasers should check local laws before ordering this blank pistol or blanks. Birchwood Casey Gun Scrubber - 10 oz.